Because of the difficulty in procuring an elk tag in many eastern states, western elk hunting has become the way to go for a majority of big game hunters. Progressive conservation methods have allowed many of these states to see a boon in not just their elk herd populations but in the number of mature bulls, year after year. The various terrains, from open grassy fields to mountains and streams, make for picturesque settings in which to bag the trophy elk so many hunters dream of. Whether opting for a hunt in Montana, Idaho or New Mexico, hunters can take advantage of moderately priced elk tags and set out on the hunting trip of a lifetime. When opting for western elk hunting, many find there is no end to the number of outfitters that offer guide services to hunters during the fall season. One can choose from not only a number of landscapes and environments in any number of states, there are also public or private hunting grounds to choose from. Guided hunts by foot or horseback are available as are lodges, motels and tent camping. The more experienced hunter or group of hunters can opt for drop camps in remote locations only accessible by aircraft. 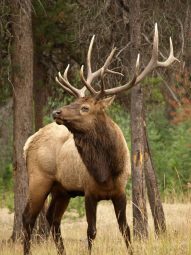 All this can be an attractive alternative for hunters unwilling to wait the number of years it may take to get an elk tag in eastern states such as Pennsylvania or Kentucky. Depending on preference, western elk hunting can be an affordable venture for even the most frugal huntsman. While the heavier priced lodges that offer every amenity for their clients can seem daunting, it also means that every aspect of the hunt is likely to be covered upon arrival. This can be of great help, saving on time and effort for the hunter. He or she will basically need to show up with gun in hand. However, there are those who prefer to rough it with the bare basics. These types of trips can be one of the most affordable. The experienced hunter who knows their way around an elk hunt and needs no guide is likely to have the most affordable western elk hunting experience. As time and other variables can have an effect on price changes from year to year, the first step is to research states for western elk hunting such as Montana, Idaho or Utah for cost comparisons. Although the costs of licenses tend to run neck and neck in most states, some are known to have significantly lower fees than others. The difference for hunting on private or public hunting grounds should also be kept in mind. For those who prefer to let the outfitter handle all the details, it can simply be a matter of choosing the setting and the state.